Radiation is a daily fact of life. It is all around us. Since radiation is naturally occurring, there should be no need to be concerned about radiation. Right? Wrong. While radiation is indeed a fact of life, there is no such thing as a “safe” dose of radiation exposure other than that which is in fact naturally occurring. Uranium exposed though the process of mining is not naturally occurring once it is removed from the ground. Radiation is emitted when elements break down into simpler and more stable elements. It is also created as a byproduct when certain isotopes — especially uranium and plutonium — are split apart artificially in nuclear weapons and nuclear power reactors. There are three primary forms of radiation. Alpha radiation is the least dangerous and damaging — so long as material that’s emitting alpha radiation isn’t ingested. Alpha radiation travels slowly and is easily blocked by skin or clothing. 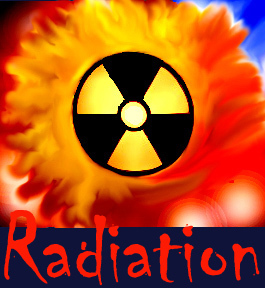 Humans are harmed by alpha radiation only if they ingest the material — for example, by eating an apple or other radioactively contaminated material or by having the contamination enter our blood stream via an open wound. Beta radiation is a more serious threat to humans and other life forms. It has one hundred times the penetrating power of alpha radiation and is also far more ionizing (i.e., it changes the substance with which it comes into contact). It is still possible to stop beta radiation with simple measures such as aluminum foil, but still quite dangerous to the health and wellbeing of humans, especially if ingested. Gamma radiation is by the far the most dangerous radiation. It penetrates deeply into surfaces and causes great damage very quickly, changing the structure (or killing) the cells with which it comes into contact. One need not worry about having to ingest a contaminated substance in order to be gravely harmed by gamma radiation. So, when you hear someone say that radiation is all around us and therefore it is not necessary to worry about radiation — ask them exactly what form of radiation they are talking about. In addition to the type of radiation that is emitted, each radioactive substance has a half-life, the length of time it takes to decay into another element. All elements strive for stability and are constantly working towards becoming stable. Elements do this by shedding off neutrons or protons (or sometimes adding them), trying to find a balance in their existence. This process creates radiation — energy-that radiates outward. Ultimately, even if it takes millions of years, the element becomes stable and stops decaying. You can think of it as being a rubber ball bouncing on a floor. You throw the ball up into the air. Its highest level is its life. It then falls to the floor (decaying), hits the floor and bounces back up. Gravity being what it is, it bounces to exactly half the height it originally achieved — that’s the ball’s half-life. It keeps doing this until it finally reaches the point where its bounce is either so minimal that it is unobservable or the ball comes to rest on the floor. Through this whole process, the ball is sending out waves of air — that’s the radiation. Imagine that some waves of air are simply air molecules. They arrive at you and bounce off, with no damage done — that’s the alpha radiation. Some air waves though, carry small specks of sand with them. These specks hit you and you feel discomfort. Perhaps a few enter your eye and you feel pain and discomfort. Some might enter your mouth and, as they accumulate, begin to affect your ability to breath. This is the beta radiation reaching you. And then there are the pebbles that are carried in the air waves. These strike your face and you begin to bleed. A few enter your mouth and block your air passage immediately, keeping you from breathing. This is the gamma radiation that is causing immediate damage when it touches you. No matter how you cut it, radiation causes damage. Even when used for medical purposes, radiation causes damage (e.g., the use of radiation to treat cancer by destroying the cancerous cells). The mining of uranium and its use in the nuclear power and nuclear weapons industries (as well as in the manufacture of depleted uranium weapons) brings the radioactive substances to the surface, creates fissile materials, and exposes us, animals and other living things to radiation that otherwise would rightfully be buried and contained deep underground where it can do no harm.